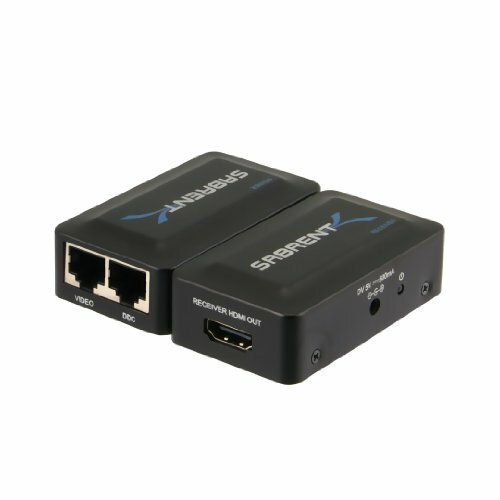 The Sabrent HDMI Extender allows you to extend HDMI media signals over Cat5E cable up to 200 feet. Reliable HDMI transmission signal is generally limited to 15 feet. But with this extender you can boost that signal up to 200 feel (60 Meters). It uses Cat5E cable as a substitute for HDMI cable, allowing for long cable runs, such as in-wall installations. * One set pairs off as a stand-alone module; no settings required. * Uses CAT5E cable in place of HDMI cable to achieve long distance transmission. * Auto-adjustment of feedback, equalization and amplification. * Signaling rates up to 2.25Gbits in support of 1080P display. * Each port supports HDMI or DVI inputs.